You might think David Booth would be in the gloating mood when he was reminded that at one point in mid-January, 49 of the 50 U.S. states had snow on the ground, with the lone exception being Florida. It wasn't exactly balmy weather when Booth spoke with NHLPA.com, 19 Celsius or 66 Fahrenheit, depending on where you call home, but it was far warmer than a vast majority of spots across the States. But it doesn't mean Booth, the 53rd overall selection of the Panthers in the 2004 NHL Entry Draft, is complaining about living in the Sunshine State for a majority of the year. Warm weather, he admits, does have its' perks. 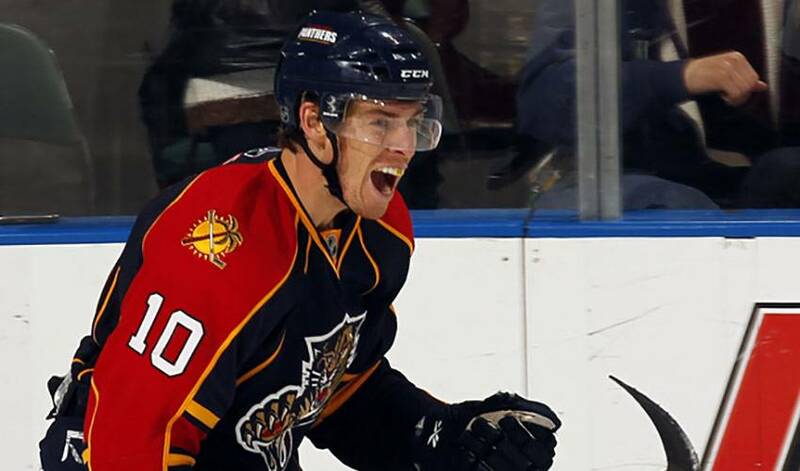 Booth, who made his NHL debut on November 20, 2006, against the Boston Bruins, is hoping the Panthers can maintain their strong focus of late and turn it into a playoff spot in the Eastern Conference. A return to the top eight would be a welcome one for the Panthers. Florida has missed the post-season for nine consecutive campaigns, including a 32-win year in 2009-10, a record that put them in the basement of the Southeast Division. A recent 4-3 overtime win against rival Washington might not have been their best effort (the Panthers blew a 3-0 lead), but netting two points after it appeared they had lost all momentum was a character win according to Booth. “Obviously, we made it tough on ourselves after having a big lead, but we didn't let it get us down,” said the left-winger, who recorded his first NHL point on December 12, 2006 against the Anaheim Ducks, and his first NHL goal on January 4, 2007 against the Calgary Flames. “We know we have to work hard and not get flustered. We've played half the season and we've been in it in 37 of those games. While they're currently on the outside looking in, Booth sees an extended home stand as a key chapter in their playoff fortunes. Booth is looking to add to his goal total, hoping his contributions translate into valuable points for the Panthers. Despite the lack of playoff success and another campaign where a post-season placing is a question mark, Booth, a CCHA All-Rookie Team member in 2003, is happy to be patrolling the wing for the Panthers. It might be a far cry from the chilly days and nights spent outside playing road hockey in Michigan, but Booth isn't complaining one bit. “I really do like it here,” he said. “Obviously, I'd like to get my first chance at being in the playoffs, but I've really gotten used to playing here. It would be that much better if David Booth finally gets to take his shot at Stanley Cup glory.